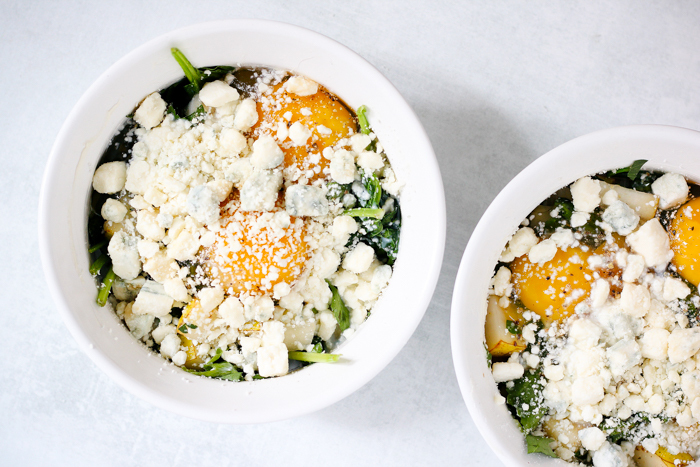 This baked egg dish mixes sweet and savory with diced pears, chopped herbs, and melty blue cheese. 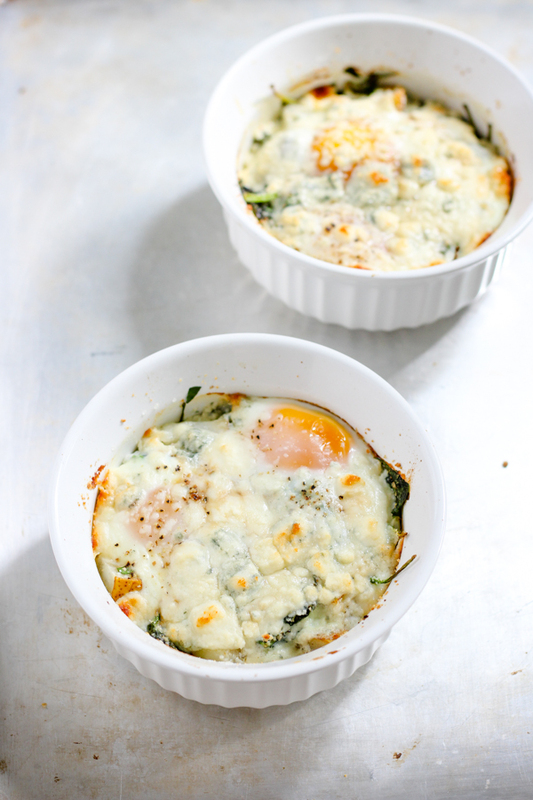 It’s easy to assemble and perfect for a weekend brunch! Here’s a little video showing how easy this is to make! 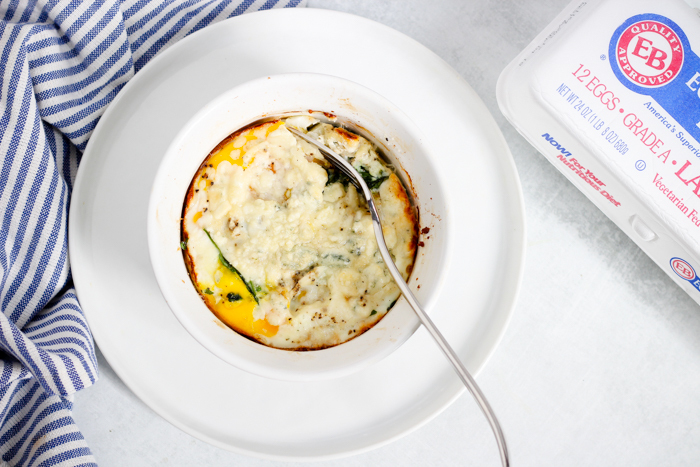 This recipe is a new take on my Red Pepper and Power Greens Egg Bake. 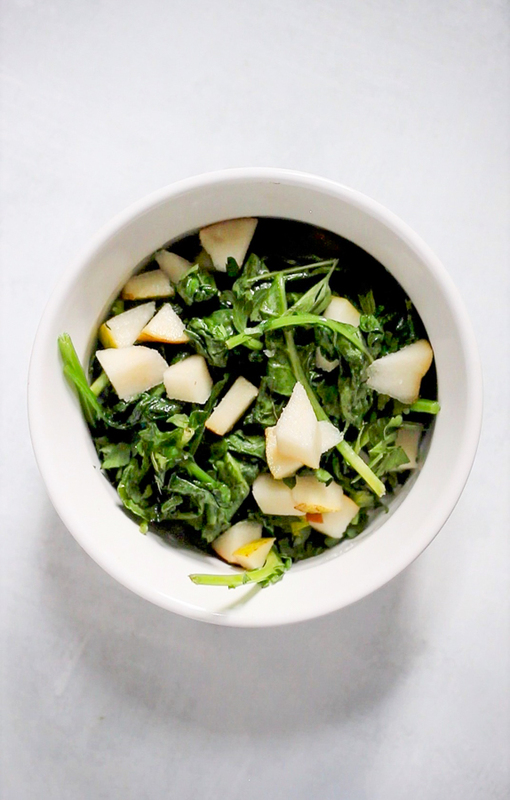 The pepper is swapped out for pear and fresh herbs for a summer inspired dish. 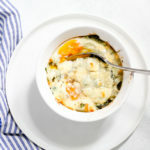 The sweet and savory combination would be good with any kind of cheese – I used crumbly blue cheese which was delicious but crumbled goat cheese or diced brie would also be great! You really can’t go wrong. 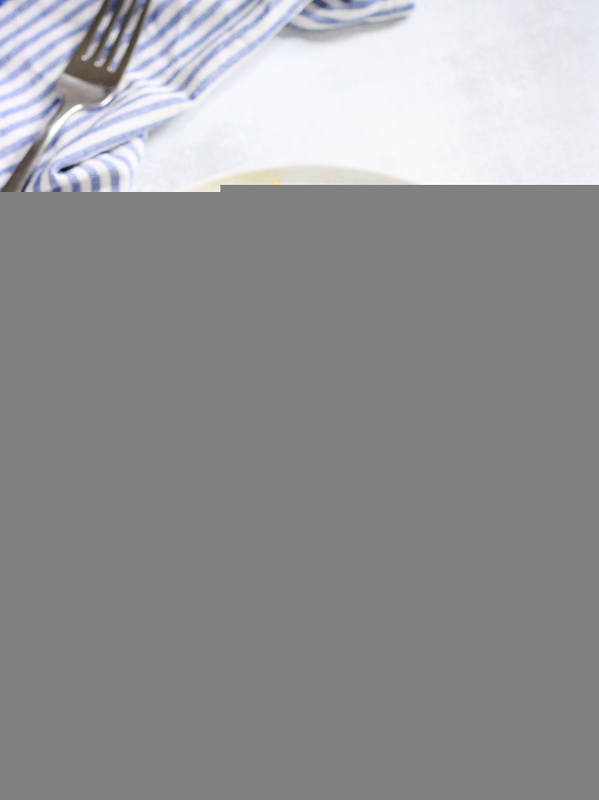 Eggland’s Best eggs are a staple in my weekly meals. I eat them scrambled for breakfast, fried on top of salads for lunch, or hard-boiled snacks and appetizers. A veggie scramble is my go-to clean-out-the-fridge dinner! A lot of good nutrition is packed into a single small shell. Thanks to a special blend of feed, when compared to ordinary eggs, Eggland’s Best eggs contain six times more vitamin D, 25% less saturated fat, more than double the omega-3s, ten times more vitamin E, and more than double vitamin B12. 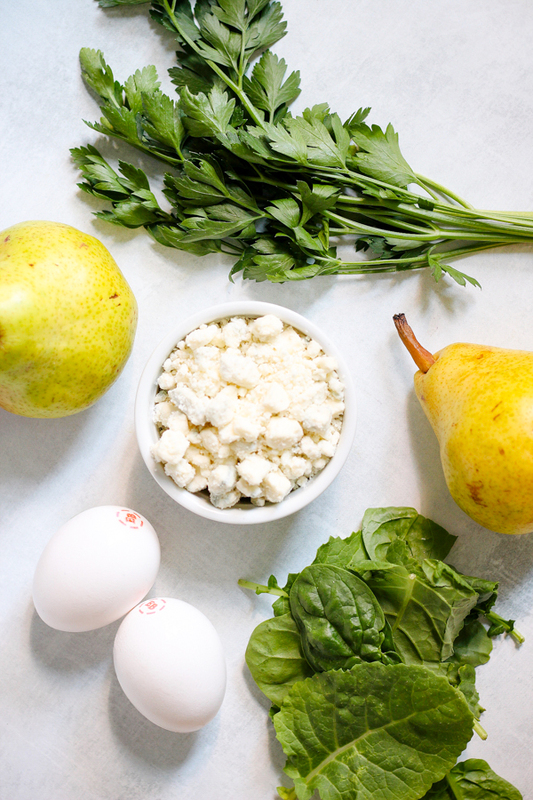 Eggland’s Best eggs are also an excellent source of vitamin B2 (Riboflavin) and vitamin B5. 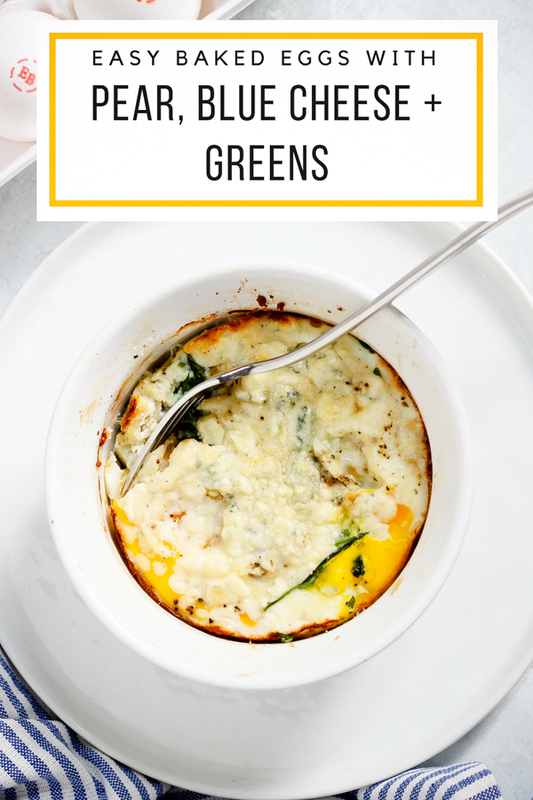 Sautee or wilt your greens, then add into the ramekin with the diced pear and parsley. Then crack the eggs in! 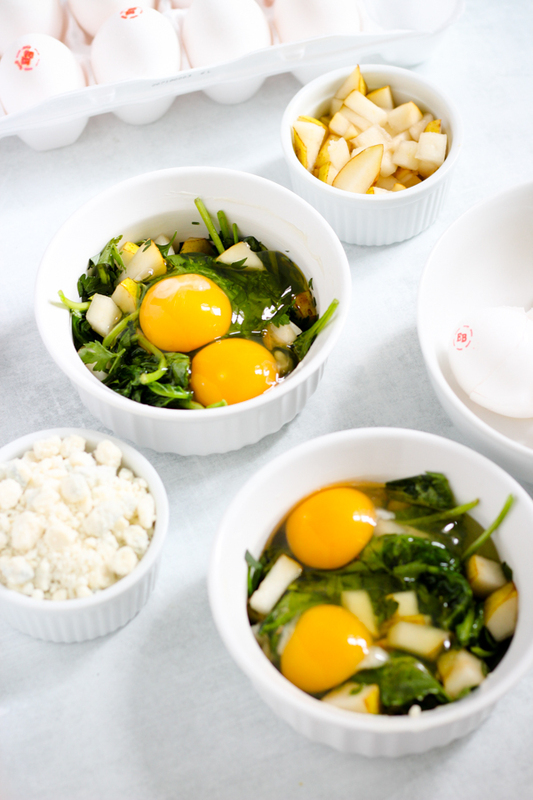 Bake at 425 degrees for 15-18 minutes, depending on how well cooked you want your egg yolks. I baked these on a cookie sheet so they were easy to get in and out of the oven. Let cool slightly, then dig in! Grease ramekin with butter and set aside. Melt remaining butter in a skillet on medium heat and wilt greens for about 5 minutes. 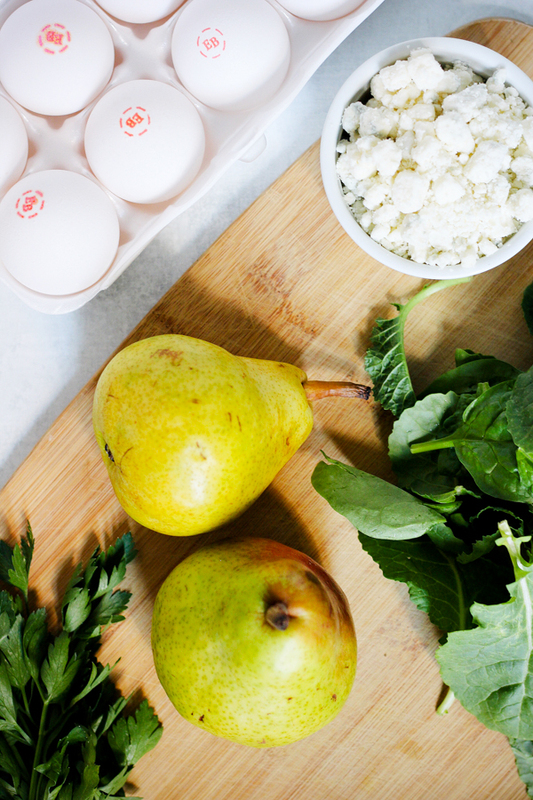 Split the cooked greens, herbs and pear between dishes and crack two eggs in each dish. Pour a tablespoon of half and half (or milk) over each. 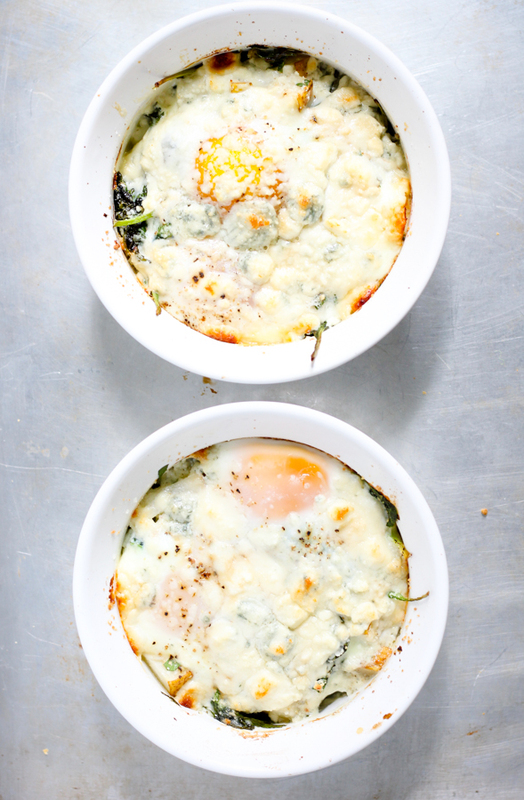 Bake for 15-18 minutes, depending on how well cooked you want your yolks to be. Thanks to Eggland’s Best for sponsoring this post. Looks wonderful. I made your last baked egg dish and it was great. Recipe looks good, but I’m sad to see the styrofoam egg carton- I only get eggs in paper egg carton since it is better for the environment. Perhaps if Eggland Best is monitoring comments they’ll consider choosing sustainable packaging. I agree Karen . . . and also allow their chickens free range, not just cage free . . . I agree with you – local free-range eggs are the best choice (bonus if they range in your backyard! ), but many people don’t have access to those, so if you do shop at a regular grocery store, this is one of the best national brands to choose. The organic eggs are free to roam. My family only eats Eggland’s Best! Several years ago, we raised chickens and had fresh eggs. Unbeknownst to me, chickens only lay consistently for two years. Once they stopped laying, chicken keeping lost its appeal. However, we got accustomed to high quality eggs. Eggland’s Best are the eggs we found to be closest to fresh backyard eggs. Not sure where you heard that, but it’s not true, if they appropriately, and given oyster shell. They require extra calcium to continue laying- 5 – 7 years is standard. We have a block of feta that I think should go beautifully in this dish! I’ll be grabbing a pear to use next week. I’ll be making my friend’s recipe for baked pb blueberry oatmeal in mason jars tomorrow. I’m so thankful to have this recipe to try soon too! These look so tasty. Wondering…. are these individual ramekins or a larger one. Thanks for the recipe. I would call them individual. I believe they hold 6 ounces. Kath, the ads on your site recently have made it really difficult to read and browse. Once I scroll a third of the way down the page two popups take over a third each of my screen and the “X” in the corner is hidden. One also plays videos which I find really distracting. Please consider scaling back the ads for readability’s sake.